Click once on the images, then 1 second time to zoom. Fabulous Bedouin necklace, by the conservation of its protective fabric and the abundance of decoration. Two rows of stitches, but a rare profusion of hirz amulets, adorned with bells to ensure happiness and high protection. Although late nineteenth, it is a necklace that was still worn in the 1930s, at which time the silver ryals came to embellish it, according to custom. A real museum piece, a centerpiece in a collection. Weight 256 grams, 52 centimeters long, 8 cm wide, amulets size hirz + or - 45 x 55 millimeters. Check out my other ads. Ancient coral and amber, ethnic jewels, opium weights, gemstones ... Ability to group your purchases over 15 days reduce your shipping costs. Do not forget to add me to your favorites list. Old bedouin silver necklace coming from yemen gold oman, traditional design with many hirz amulets (more or less 45 x 55 mm), really nice single piece for collection, end of 19th-20th beginning, 256 grams, 52 centimeters long, 8 centimeters wide . Old amber and coral beads, tribal jewelery, oipum weights, semi-precious stones .. on 10-may-12 at 02:00:11 BST, the seller added the following information. Add a map to your own listings. 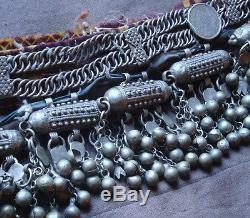 The item "old necklace morocco silver ethnic tribal yemen 256g antique silver necklace" is on sale since Sunday, January 15, 2017. It is in the category "art, antiques \ art of the nineteenth and before \ arts, ethnic objects". The seller is "antikapsaras" and is located in landaul.